Alright. It's happened again. I've found mind-blowing gardening tips and tricks over at Pinterest. A few years back for my birthday, my hubby made me a small raised rock garden in our little back yard. The next year, he added a second one along our fence line. We have loved experimenting and trying to grow things in our "small but mighty" garden. We love pretending we are farmers, or better yet, the Ingalls. One thing that grows for us really well... I'm talking maybe a bit too well, is zucchini. The only trouble with a thriving zucchini plant in a small garden - is space! The giant leaves spread out and take up a very large area of our tiny garden, making it a little harder to grow other kinds of veggies. Here's a shot of our garden last August. 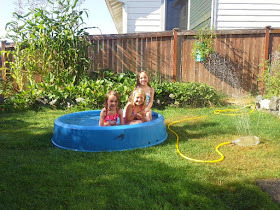 You can see the zucchini plants in the middle right behind the girls in the pool (between the corn and strawberries). It really takes OVER. The girls love tending our little garden. So the other night I was perusing Pinterest when I stopped dead in my tracks. Here was a revolutionary way to grow zucchini (and other summer squashes) in a smaller space. In a 2x2 space! What? I was so excited. Check it out. Picture by Jeff from the blog "Our Engineered Garden"
By simply using an inverted (aka upside-down) tomato cage, you can train your zucchini leaves to grow straight up! This leaves the bottom of the plant (where the zucchini's grow) open and makes it easy to see the fruit growing. I can't tell you how many times we've pulled back a giant Jurassic sized zucchini leaf and found a gargantuan baseball bat sized tuber! This was our first giant surprise zucchini the first year of our garden. We were SHOCKED. 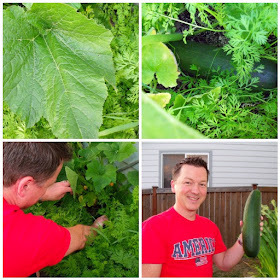 This idea of growing vertical zucchini comes from Jeff over at the blog "Our Engineered Garden" (I had a link here, but the blog is no longer available). He has amazing gardening techniques I have not even finished reading all of his tips. 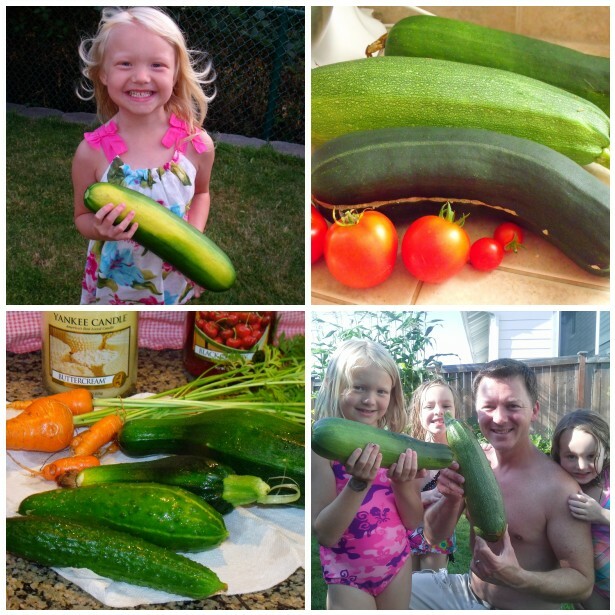 The two pictures of the zucchinis in tomato cages posted are from his blog because we are trying this asap and don't have our own pictured results yet. But if it works, it will revolutionize our little garden space! Picture by Jeff at "Our Engineered Garden"
This is going to be a great experiment. Apparently, you have to "train" the leaves daily to get them to grow the way you want them. We put our zucchini start in the ground yesterday and the upside-down tomato cage is in place. Have any of you done this before? Are any of you going to jump on the experimental band wagon and try this with me? By the way I forgot to mention it also works with a few other varieties of summer squash. I will dutifully report back to you on our progress throughout the summer. Oh and if you need a recipe to use all of this bountiful zucchini in, try our delectable baked zucchini fries recipe. Happy Gardening! UPDATE 2014! : We tried this little technique last year and it worked perfectly. The leaves grew up and it was so much easier to see the zucchini along the bottom, before they became giant bat-sized monstrosities. We have already set up our upside-down tomato cages for this years' plants. Hooray for an experiment that really worked great! I love this idea and I will be giving it a try. I have the same issues small garden and big leaves. Thanks for sharing. I love this idea. Plan on using it in my raised beds this year. I was planning on trying this with the tomato cages right-side-up. What's the advantage of putting them upside down? And how did you keep the cage from tipping over since there's nothing to poke into the ground? I did this last year with yellow squash and it worked great. Would this work for cucumbers? Cucumbers can be trained to grow on a trellis. Hi Beth. My nubby was in charge of the planting, he says that he just buried the narrowest part of the cage at the bottom by putting a layer of dirt on top of it to stay in place. I think that allowed the leaves, which get pretty big to overflow at the top. I bet either way would work. Let us know what you find. @Annemarie. I have not tried this with cucumbers but I do know they like the climb. I planted them next to my tomato plants because we had some trellises for them to climb on. One time I planted the cucumber next to the corn, and they climbed the stalks and "jumped off" as we liked to joke. I think you'd need to add some smaller netting or chicken wire to get the cucumber to climb, the tomato cages have too large of gaps between the wires for the cucumber to really cling too. I planted cucumbers on fence that has 2x3" rectangles and is used for animals. The cucumber vine had no problem climbing it. This is absolutely Genius! I've been trying to come up with a way to grow zucchini in a very small raised garden that My Family finally agreed to let me put in and let me tell you I was not sure how I was going to manage having zucchini and my other plants grow in a 3 x 3 space but with this I just might be able to pull it off. Thanks for putting this useful information out there! Thanks for the heads-up,your three little girls are darlings! I have acres but water is my issue (there's only water close to the house). I plant in raised beds close to the house, love vertical gardening along a chain link fence. Squash running all over the ground has always been an issue for me (the mower loves squash). I love your idea. I have a bunch of tomato cages that I can put to work on my squash. What a fantastic idea. Thanks for sharing! You can use the cages for cucumbers. They climb the cage in a spiral. Works great. I really hope this works ! I just bought zucchini, yellow squash, spaghetti squash and 2 different types of cucumber. My husband said we don't have room but I just have to plant these an try !!!! Thanks for this wonderful idea! Though late in the season for this year. i will definitely try it next year! Very exciting. I have never tried this with zucchini, however I have used this technique on my Peony plants. Works great! I have never tried the cage but I do use knitting yarn to tie the leaves up. Once they get fairly large I grab some chunky yarn that I have no plans for, while my husband holds the leaves I just tie them up. I have also used this on potato plants as well. I wish this worked for me! My flowers kept falling off or if a small zucchini started growing it turned rotten. Bummed. My husband and I are so excited we found this post on Pinterest!! We are going to try this next year with our zukes, cucumbers, and yellow squash! Thank you for sharing this with the rest of us! Did you use a bush variety of the regular full sixes plants? A frame that is supported by cross bars of wood to trail the zucchini up on. It works very well. Doesn't take over my garden. I am a novice gardener, with a small garden space. I love the tomato cage idea, but if upside down, how do I prevent the cage from moving with the growth of the plant. And also, my cukes and zucs are in the ground and flourishing. Is it a gardening no no to try and train them now? Should I wait until next season?? Thanks! I was pretty skeptical of this idea when I saw it, but it really DOES work perfectly. I used a large-size round tomato cage and put it in the ground the normal way, not upside-down. I admit I didn't get all of the leaves trained in time (the stems are too brittle to try to tuck them in once they get too long), but most are standing upright and the zucchini are so much easier to get to than when the plants sprawl. No more trampling all over the leaves trying to pick the squash. Next year I may build some cages that are a little taller, because some of my leaves are standing pretty high over the top ring of the cage right now and I'm afraid they will probably eventually break. Many thanks to you and your original source for posting this idea on Pinterest! Great idea! I live in rattlesnake country so it sure will be nice to be able to see where I am putting my hands! Newbie gardener, will try this in my new raised 4' x 8' bed. Thanks! I intend to try the tomato cages on my zucchini, but thought I would do them right side up. To prevent breakage on the rims off the top of the cage, I plan to slice pool noodles lengthwise and slip them over the rims before the plants get that big. Does anybody think this will work? I hope so. Great tips! This will work for me. We generally grow tomatoes in our home garden. Thank's for the great idea! There is no way the zucchini plant I grew last year would ever fit inside a tomato cage. It was HUGE! The clever crafty cookin Mama LOVES comments! Some are moderated, so it might take a few moments for your comment to appear. Thank you so much and have a wonderful day!